Using RFP Software, proposal professionals and RFP responders quickly answer request for proposals (RFPs) and other customer questionnaires with relevant and compliant answers. SalesEdge provides the training and implementation methodology that can help you achieve better proposal and RFP results using the right technology for your specific needs. The SalesEdge methodology is tailored to help organizations of any size realize results. With Qvidian RFP and proposal automation you can quickly search your database of answers to find high probability matches for each question. You'll be able to quickly generate a professional RFP response — including cover letter, title page, table of contents, compliance matrix, and the questions and answers — in the Microsoft Word or Excel template of your choosing. And because Qvidian is accessed through your browser, there's no need to install or maintain sales proposal software. Quickly generate a professional RFP response document—including cover letter, title page, table of contents, compliance matrix, and the questions and answers in a proposal format that is branded to your organization. And because Qvidian is accessed through your browser, there's no need to install or maintain sales proposal software. Regardless of the team’s size or complexity, to deliver more winning RFP responses, most organizations seek the following capabilities. Your RFP software must make it easy for you to upload existing answer content. For most organizations, the latest five (5) best RFP responses, or response to due diligence questionnaires, provides an excellent source for the foundation of your RFP response-ready database. You may also have captured information in another informally-managed database. Time is both precious and a sales-critical element. You need to quickly find the right information and promptly respond to questionnaires and ad hoc inquiries from your clients. Your RFP software must make it easy for you to find and apply the right information. Your RFP software should make it easy to assemble the sales-ready response document. Using an RFP response template, you can quickly create RFP responses that are highly professional and set your responses apart from the competition. SalesEdge will tailor the RFP response template to your brand—or provide you with branding options. Your RFP response-ready database must be dynamic and constantly updated with your latest and best information. Your RFP software must make it easy for you to update individual content records, as well as support batch review and update processes. You need to be able to collaborate with other team members when responding to questionnaires, as well as manage content updates. Your RFP software must make it easy for you to engage other team members—and collect their contributions. Do you know where your content is? Which team members are contributing to your organization’s proposal success? How many proposals you produce for the team? 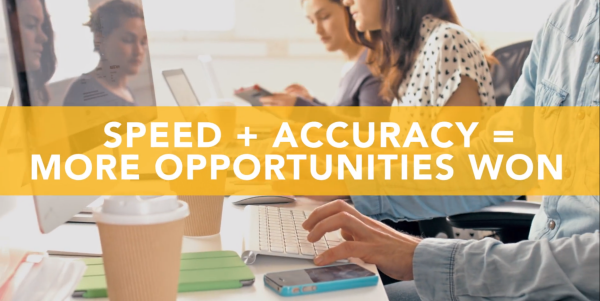 Your RFP software should help you prepare the quantitative information that helps you keep your content ready for the next sales opportunity! "Because of our past success working with SalesEdge, we selected Qvidian . Knowing the SalesEdge team was standing behind this product really influenced our decision!"